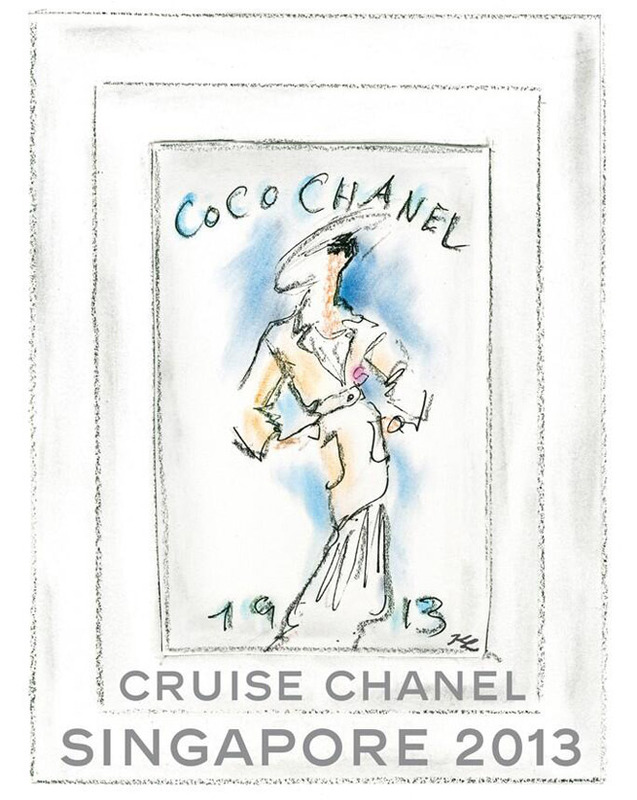 When I heard that Karl was taking the Chanel Cruise 2014 collection to Singapore I was interested to see the cultural references in the clothes. The Chanel Cruise collections are always some of the most extravagant and vibrant, really taking cues from its host city. If you have seen the Singapore collection you may have missed the cultural references, but they are there... somewhere. The jackets, for example, reference the fisherman jackets of the 1800's which have few buttons, many pockets, and come in many shades of beige. Further, Karl states the black and white palette is similar to that of the curtains that can be seen hanging in the homes across the city. Beyond that, the references seem to stop, and what we are left with is a classic Chanel collection, only better. 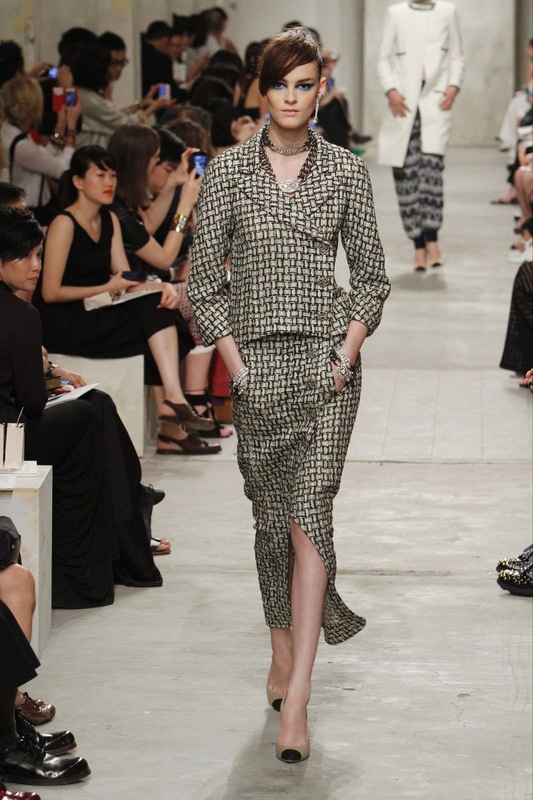 The Cruise collection is one of the best I have seen from Karl in a few seasons. Sure, it isn't ground breaking, but it is beautiful. The fit of all the wide leg pants is spot on. The draping of pearls on just about anything is perfect. And those last three evening dresses? Divine. 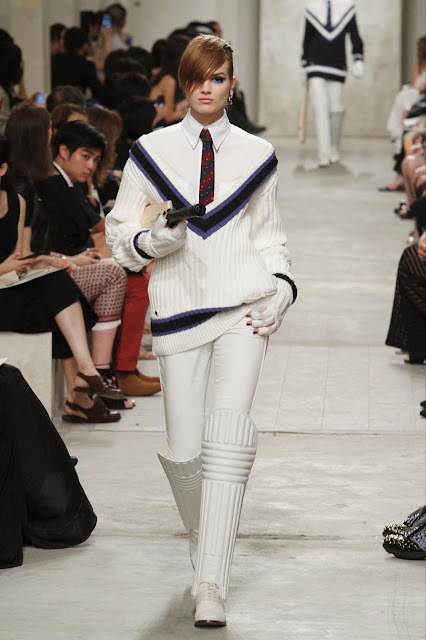 And of course, it wouldn't be a Chanel collection without a gimmick. I am not too sure what Cricket has to do with Singapore, but I am all for those whites. PUNK, or something like it. It is that time of year again.. the fashion Olympics are here. The MET gala produces some of the biggest fashion moments every year, if not, of all time. On Sunday celebrities, models, designers and socialites descended upon the stairs of the Metropolitan Museum of Art for the annual Costume Institute Gala. The MET Gala is not just about that one night of course. It marks the opening of the new exhibit that will run the course of the summer. This years exhibit is titled 'PUNK: Chaos to Couture' and highlights over a hundred looks stemming from the 1970s through to today. The exhibition celebrates where DIY meets made-to-measure, and is divided into several themes including New York and London, Clothes for Heroes, and Hardware, Bricolage, Graffiti and Agitpop, and Destroy. Those of you lucky enough to be in New York over the summer, be sure to head to the MET to take it all in. For the rest of us, the live stream of the gala will have to do. Of course, the gala has a theme every year, and in most cases, not many stick to it. I was so excited to see some incredible creations at this year's event and for the most part I found it very hit and miss. I did have a few favourites though.... Read on to be amazed. Mary-Kate Olsen in vintage Chanel Haute Couture gown and vintage Balmain coat. Vogue Australia is scoring some points with me these days. This editorial, styled by Meg Gray, is no exception. While the reflective pieces can lend themselves a little towards spring, rather than autumn, Gray keeps it current with a few great jewel-toned pieces. That Wang jacket... please make your way to my wardrobe. images via Vogue Aus iPad app. Just wanted to share what I think is one of the best editorials we have seen in Vogue Australia in a long time.